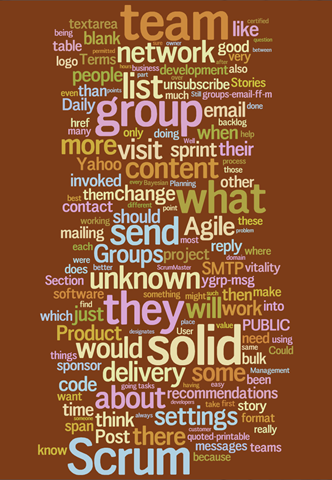 Scrum Development is a Scrum community email group with high traffic (excellent resource for those who are involved with Agile in any form). 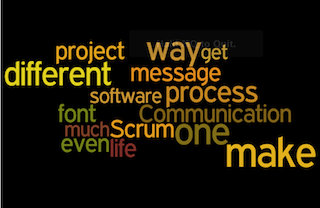 Cory Foy made an effort to analyze the huge repository of email threads in Scrum Development over the years using Wordle. The idea was to see what was being said most commonly over years – and in a way get a sense of what the community considers important. This is interesting – and useful. It’s a nice handy tool. What is important is the concept of making sense of the data from past that you have and get some insights into it. May be that helps you going forward. Past behaviors can be good indicators for future. This entry was posted in Knowledge Work, Productivity and tagged Analysis. Bookmark the permalink.